FOR EACH COPY OF THE BOOK PURCHASED! “Storie dei cinque elementi” is an itinerary through the reigns of air, water, earth, fire and…the fifth element. 16 modern fables, stories, dreams and visions of the future, that create a magical voyage for both the young and the older readers. An audio book version in 2 cds comes with the book, with well-known personalities from the show business (Elisa, Giorgia, Fiorello, Dose e Presta, Aldo, Giovanni e Giacomo, Baccarini, Lighea, Gualazzi, Petretti, Marcorè, Fiorello, Fabi, Sagramola, Parigi, Facchinetti, Pandolfi) reading the stories for all those kids who don’t yet know how to read and the older boys and adults who love to listen to them. Wayana, Hammer, Borana, Dogon, Huicholes, Juruna, and many more … men and women from the desert, the cordillera, the endless savannas or the dark tropical forests. People whose onomatopoeic and misterious names ask us to travel, to dive into the unknown. Furthermore, they are precarious, proud and tenacious custodians of traditions and of a way of life that our “civilization” relentlessly tries to ignore, or even worse, to destroy. Upon returning from a trip, in your suitcase you will discover the objects that marvel us, found there where others live, the remote places where the Fantasia del Viaggiatore, the traveler’s imagination, has led us. Objects that talk of a sense of belonging or simple ornaments, crafted with skill and patience out of colorful feathers and textiles, wood, plants, even pearls or coral. Objects for everyday use or with ritual significance. Each one of them obeys to traditions transmitted over time in worlds that exist outside of our time. Among them the Shaman cloacks of the Amazon Indians, the Berber fabrics, with their unusual, somewhat surreal simbology and the head rests from Eastern Africa, indispensable to rest or sit during the journey, with their elegant geometric patterns. And the necklace of the Papuan “Medicine Man” with a cassowary head, or the herbs bronze cup, from Benin, with a regal procession on its lid. 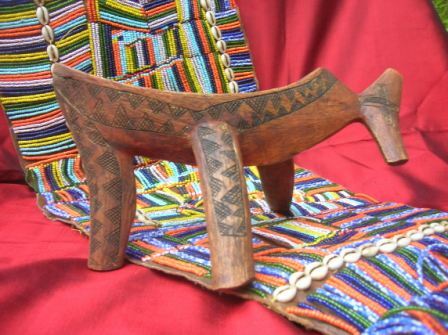 An altar from a Bolivian mine, a moving example of folk art, or the wood and leather containers for milk and butter of the nomads of Eastern Africa. And much more. Upon our return, our suitcase will contain something we met by chance, unexpectedly, an odd object that evokes distant places. The exhibit will be open even on Wednesday 25 April from 11 AM to 1 PM and from 5 to 8 PM. 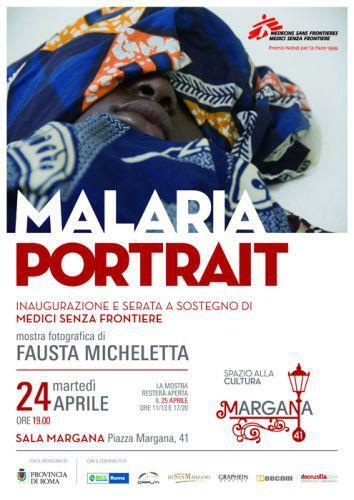 On the World Malaria Day, instituted by the World Health Assembly in May 2007 as a day for recognizing the global effort to provide effective control of malaria, Associazione Margana41 presents MALARIA PORTRAIT, a photography exhibit by Fausta Micheletta and an evening event to increase awareness and raise funds for Doctors Without Borders. In the course of the evening Gualtiero Burzi, Carola Clavarino, Alessandro Giuggioli, Melania Maccaferri e Arianna Mattioli wil read excerpts from “Dignity! Nine writers for Doctors Without Borders”, a volume published by Feltrinelli with writings and short stories by Esmahan Aykol, Eliane Brum, Tishani Doshi, Catherine Dunne, Alicia Giménez-Bartlett, Paul Jordan, James Levine, Wilfried N’sondé, Mario Vargas Llosa. The reading is organized by Francesca Sanna. Doctor Fausta Micheletta, author of the photographs and Kostas Moschochoriti, head of Médecins Sans Frontières for Italy, will be present for the evening.